Hope to see you soon, or, call for a free catalogue on your bike!! free of charge in the post to you. You can plan your trip up and perhaps spend a weekend in beautiful Matlock and surrounding biking roads with cheap accommodation all over the place or camping available too Call us !! we have over 5000 products in stock-no BS! TAKE THE SLIP ROAD OFF AT TEE JUNCTION AT BOTTOM TURN RIGHT AND FIRST RIGHT -AGAIN THIS IS ONLY ABOUT 50 YARDS!! IF YOU REACH GK FORD ,MACDONALDS ,YOU HAVE TURNED THE WRONG WAY .THE KETTLES ALWAYS ON ! WE CAN HELP YOU FIT SATURDAYS AND CAN POST OLD PARTS BACK YOU REMOVE EVEN EXHAUSTS SEATS AND LARGE ITEMS- . 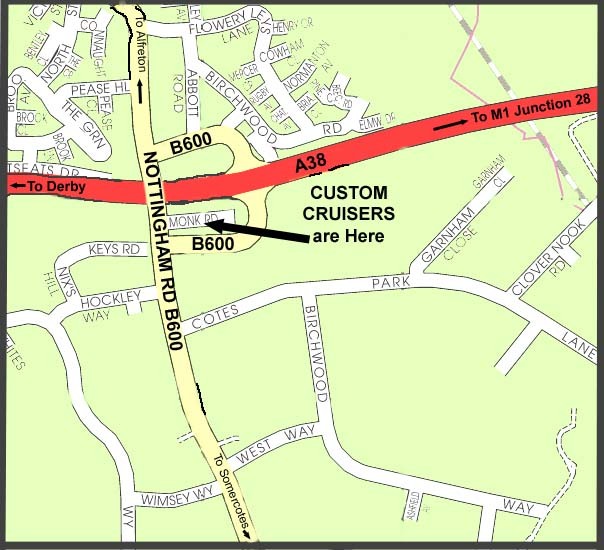 Custom Cruisers UK Limited is a company registered in England and Wales under company number: 03510929. VAT number: GB 706295433.